Imagine a candidate for president challenging the political parties to begin having a healthier conversation about values. Now, imagine that candidate is a Democrat. Awkward, right? The virtues of family and Christian values are not Democrat mantras. Chants of “freedom” are also not in the typical liberal playbook. I never understood why not. And now I know why. Because it is total nonsense. These are topics that the GOP preaches about, as if only they can. They have been successful at presenting themselves as having cornered the market on American values for as long as I can remember. The Republican-American dream imagery is as vivid as a fresh-from-the-oven apple pie. Yes, it is an image one can almost smell too. Pete Buttigieg, of all people, is changing that conversation. “People talk about things like marriage equality as a moral issue, and it is certainly a moral issue as far as I’m concerned,” Mayor Pete said in speech on Sunday night. This kind of politician speak is as common as a Joe Biden hug. So, what’s the weird part? “It’s a moral issue because being married to Chasten has made me a better human being. Because it has made me more compassionate, more understanding, more self-aware, and more decent…” Buttigieg continued. And there’s more. Again though, these words are typical of a newly and happily married person. I remember thinking the same thing when I was still technically a newlywed. And listening to these comments reminded me that I still feel that way. Judging by the GOP reaction, and both Mike and Karen Pence’s specifically, one might think those comments were some kind of attack on them. They would be wrong about that, but I understand why they are so sensitive about the discussion. Make no mistake about it. 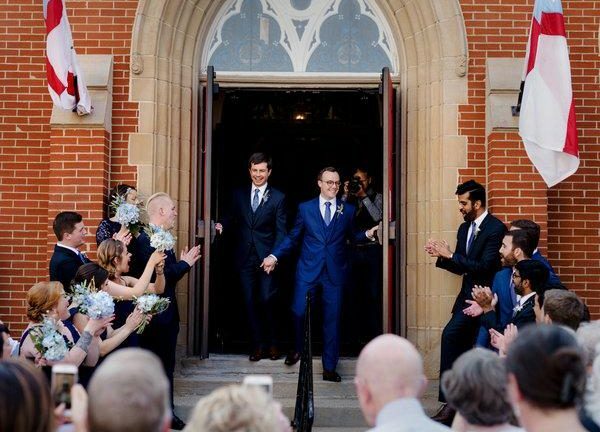 When Pence was Governor of Indiana, he actively tried to make marriages like Pete and Chasten Buttigieg’s invalid, or impossible in the state. I can’t tell you how glad I am that he failed. I’m not as glad as the Buttiegieg’s, but their happiness is contagious. Wouldn’t it be something if a politician’s private life caused an infectious and viral sense of joy? That would definitely shock our political system. The real reason why this matters is not just about these two couples and their personal lives. Not exactly. The important part of it is that Mayor Pete wants Americans to know the values by which he and his family live. He wants us to know about those values first. They are the foundation of his campaign and I expect will be the root of his policy positions. First things first though. He is introducing himself to the nation not by attacking Pence, or even Trump, which is the easiest, laziest thing to do for any Democrat today. He is introducing himself by being as virtuous and exemplary as Pence claims to be. And he is doing it all while being gay. That’s the really awkward part for some people, although I am happy to report that more than 70% of Americans are comfortable with a gay president. Maybe that’s why so many in the GOP feel like they are being attacked. A gay couple shouldn’t be able to make Americans believe they have classic American values. That’s just not fair. Democrats can have faith. They can be tough and care about the environment. They can be compassionate toward people, and intolerant of authoritarian regimes across the globe. They can be gay and virtuous. They can be a Rhodes Scholar and a veteran. “I work very hard to make sure that when we oppose this president we’re not emulating him,” Buttigieg said in an interview on ABC’s Good Morning America last week. Talk about awkward. He’s going to oppose the Trump/Pence team with class? That must terrify them. His top priority was to give voters an idea of what makes him tick. At his campaign kick off on Sunday in South Bend, expect to hear fresh ideas about his values translating into real American progress. Awkward. And thank God for that.